Focus on the breath and the repetition of the breath. 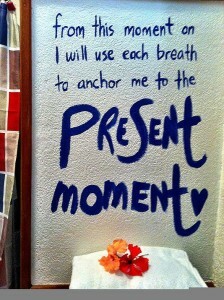 The awareness of each and every breath leads to better breathing as well as physical and emotional relaxation. Focus on individual sounds around you. Incorporating environmental sounds can help you to focus on something other than what may be causing you stress and worry. An example of a sound commonly used in meditation is the sound of rain failing. Also, the wind blowing or even vibrations of pure silence also work well. Zoning in on physical sensations of, and around, your body can help to pull your mind back into the grounding energy of the physical body. Examples of this include focusing on specific feelings you are experiencing or your hands, feel, chest, and becoming aware of the life energy that is flowing throughout the entire body. Mindful eating is another technique. Focusing on food, the texture, and the flavors is a technique that works well with dieting as you are putting your attention on the food rather than the effects of the food on your body. Observation of thoughts I yet another technique, as simply observing the thoughts that enter the mind and allowing them to just be there rather than trying to banish them is helpful. This act creates the ability to release the thoughts that are stressing and/or worrying you. You can also try to bring attention to the thoughts by giving them labels. This allows for you to process negative thoughts in a healthy way, prior to eliminating them from your mind. In the practice of mindfulness, we are constantly bringing our conscious attention back to the present and all of the sensations of the present. This activity teaches us to acknowledge, recognize and come to terms with our feelings, rather than just trying to block them our or push them away. This practice allows us to become much more able to experience mental clarity that can benefit us in all aspects of life.